Someone sent me an email the other day. There's nothing strange about that. I get LOTS of emails, as I'm sure do you. I'll get to what was strange later, but first let me tell you about the purpose of the email. 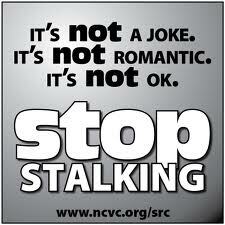 It announced that January is National Stalking Awareness Month. The email came with lots of helpful facts about stalking such as the amount of states that have anti-stalking laws (50), a reminder that 1/3 of stalkers have stalked before and, most interestingly, that 1 in 4 victims report being stalked through the usage of some form of technology. This was all good. I mean, good to know, bad when it happens. The email then asked if I would consider doing something (anything) to help get the word out about stalking awarness month. And then, before I could delete it I got another email from the same email address. That's odd, I thought but, you know, maybe someone just clicked send twice. I didn't think about it too much until I received another exhortation to consider supporting National Stalking Awareness Month via Twitter. And then another. After that I got two more emails on my personal account followed by a message on Facebook. The question was obvious. Was I being stalked by the National Stalking Awareness Campaign? I'm a writer. More specifically, a fiction writer, which means my brain takes miniscule pieces of information and extracts them into whole novels. My brain did not like the above question. In fact, it was the kind of question that had the power to (of course this is all theoretical) make my brain wake up at the sound of a car door in the middle of the night. I might have shaken my husband awake with every husband's favorite 2:00 AM question. "Honey, who is that parked in our driveway!?" In this hypothetical scenario he might have searched for his glasses, peered out the window and snapped, "That's the guy who delivers the newspaper." "Yes, but he's parked. What do you think he's doing out there?" "I'm going back to sleep." It's true, when I think about it, that I receive a similar volume of mail (snail and e) from other organizations like Netflix and Boden and not once have I ever associated them with stalking. And it's also true that I support the Stalking Awareness campaign's cause, in much the same way I would support the anti-murder and anti-theft cause, if those causes exist. 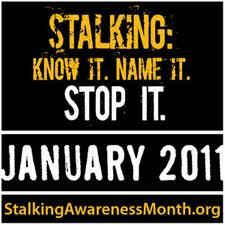 In fact, I'm so anti-stalking that I decided to write this post to promote January as National Stalking Awareness month. I mean, just in case the people in charge show up on my doorstep to ask me again, or sit outside my house in a dark car, or monitor my telephone calls, or get the guy who delivers our newspaper to watch our house in the middle of the night, or...well, you get the idea. But in case you don't I'll spell it out for you. Stalking is bad. Don't do it. People need to be aware. And I do think the National Stalking Awareness group is stalking you. 'Was I being stalked by the National Stalking Awareness Campaign? '<-lol johanna...maybe! But seriously, stalking is a scary thing. The internet has made it so much easier for nutjobs to stalk people now. Scary stuff. Oh man, I think your right. Someone needs to let their marketing department know that they really are stalking people. This is hilarious (sort of). Of course, now that you've responded to them, they may keep stalking you. Nicely handled! Stalking is serious business, but it's great that you drew attention to it with a touch of humor. As always, love your sense of humor, Johanna! I could ever figure out why someone would stalk another person. Hey, if someone doesn;t want me around then no worries. There are plenty of other people to stalk errrrr, I mean other things I can do. Alex and Naida, absolutely! It is something to be taken seriously! Jenny, the crazy thing is none of the publicity came from their marketing dept. Kate, we have similar sense of humor. Haha pretty fun take on receiving that email... but stalking... 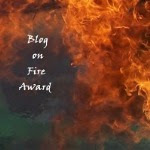 I should blog about my experience, it was a complete nightmare that was never resolved and went on for years and years. Honestly, I'm kind of afraid to talk about it online, for fear it will start again. Who knows. So, yes, awareness! it's not okay. I'm going to go check the window now then sit up all night. Thanks for keeping us updated. If anything horrible happens to you, we know what to tell the police. I could understand the repeated emails if it was a ploy to prove a point. That would've actually been quite clever on their part. Too bad it was an ironic, unintelligent advertising tactic instead. Still, stalking is terribly scary and the outcome's sometimes very tragic. So it's good of you to post this. Thanks, Johanna. Excellent way to tackle a tough subject with humour. I'm glad that stalking is starting to get the attention it deserves.